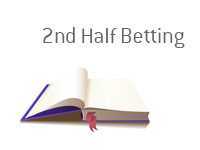 2nd Half Betting Definition - What Does 2nd Half Betting Mean? In the world of sports betting, what does the term "2nd half betting mean"? What is the definition of the term "second half betting"? The term "2nd half betting" applies to football betting (soccer for you North Americans). With "2nd half betting", you are simply choosing who will score more goals in the second half of the game. For instance - let's say that Man City is up against Man Utd 1-0 at halftime. Man Utd has been controlling the play despite allowing an early goal, and you think that there is a good chance that they will tie the game in the second half of play. You take Man Utd in the second half. Man Utd ends up scoring a late goal to tie the game 1-1. Now, despite the fact that the game ended in a tie, you still win your bet, as Man Utd won the SECOND HALF 1-0. That is second half betting.